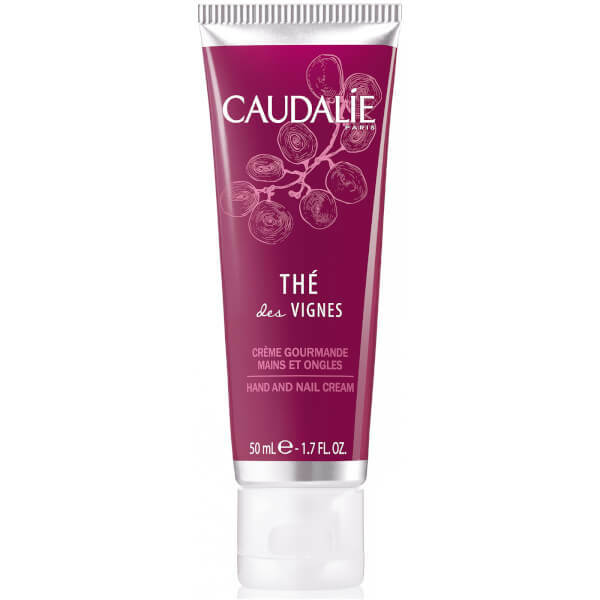 Nourish and protect with Caudalie Thé des Vignes Hand and Nail Cream; a lightweight, quick-absorbing formula with a luxurious fragrance of Neroli, Musk, Jasmine and Ginger. Fortified with Organic Shea Butter and nourishing Grape Seed, Avocado and Olive Oils, the non-greasy hand cream softens and conditions skin, whilst defending against dryness and environmental aggressors for long-lasting comfort. Rejuvenates the cuticles and nails to restore healthy-looking fingertips. Aqua/Water/Eau, Glycerin*, Cetearyl Alcohol*, Vitis Vinifera (Grape) Seed Oil*, Glyceryl Stearate*, Butyrospermum Parkii (Shea) Butter Extract*, Coco-Caprylate/Caprate*, Palmitoyl Grape Seed Extract*, Olea Europaea (Olive) Fruit Oil*, Persea Gratissima (Avocado) Oil*, Parfum (Fragrance), Sodium Cetearyl Sulfate*, Tocopheryl Acetate*, Caprylyl Glycol*, Acrylates/C10-30 Alkyl Acrylate Crosspolymer, Potassium Sorbate, Phytosterols*, Sodium Hydroxide, Carbomer, Sodium Carboxymethyl Betaglucan, Sorbitan Oleate*, Tocopherol*, Ascorbyl Palmitate, Limonene, Linalool.